Is your physical game keeping up with your brain? Now, more than ever, bowling is a thinking person’s game. To achieve the highest level in this sport, you need to not only be able to out-play the field, you need to be able to out-think them. With dynamic balls, catch-me-if-you-can oil transition, and all the other factors at play in today’s game, you need to be able to think on your feet. What if you think too much? What if your physical game can’t keep up with what your brain is telling you or, even worse, if the brain is actually hindering your physical game? How can you even tell? That is the issue at play this month. 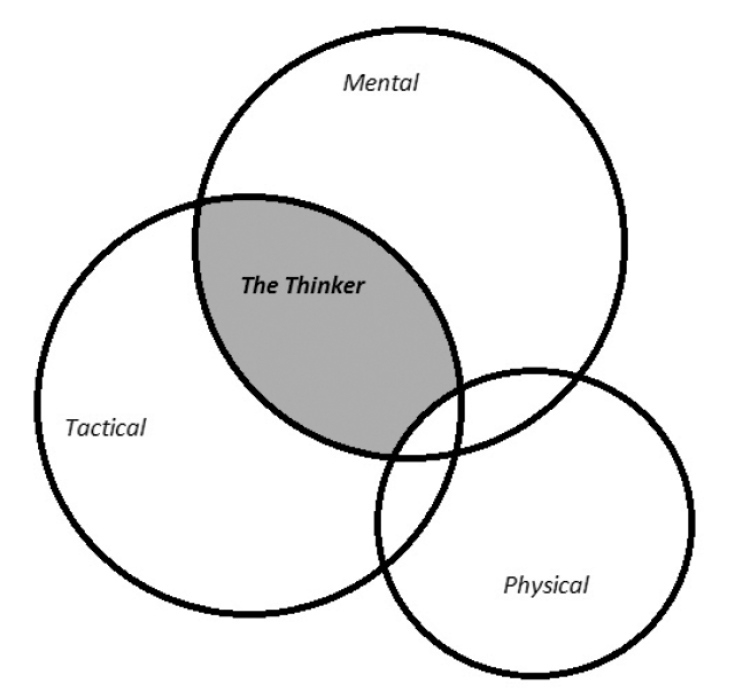 For those who don’t remember the relationship between the tactical, mental, and physical aspects of the game of bowling, “Thinkers” are bowlers whose mental and tactical abilities outweigh their physical skills. The easy solution to this problem is to practice more. Identify your physical flaws and work on them with a coach. The more interesting side of this situation is the relationship between your body and your mind and how you can get them to operate together. This article opened with the statement that bowling is a thinking person’s game, but where is the line of thinking too much, playing too little, and how did we cross it? More importantly, how do we get back to the other side? Partly, the internet is to blame. There is access to more bowling information at your fingertips today than there has ever been – written content, message boards, video services like the PBA’s Xtra Frame. Developing bowlers have a lot of information and no filter. 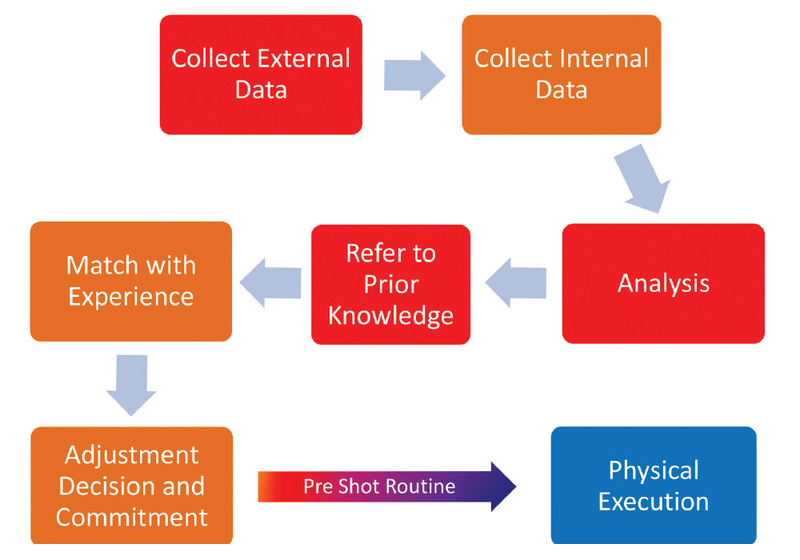 Developing and even higher end players can gain information without having the experience to transfer it into actual knowledge so the physical game can become a secondary thought. I’ll give an example. A junior bowler is bowling for the first time on a sport pattern. Having watched videos online and read articles on ball motion and pin action, he is focused on how the pins are moving and watching how the ball is rolling down the lane. He notices the flat 10 pin, gives the basic explanation of why it happened, and makes an adjustment. Everything is fine so far, but… Did he notice that even though he moved two boards right, he slid in the same place? Did he notice that his last two shots had drastically different axis rotation because his hand didn’t come out of the ball the same way? If the answer to those questions is no, then the bowler doesn’t have all the information he needs to make a quality decision. What’s worse is that while I wholeheartedly agree it is better to play smart than it is to throw it well, this bowler is becoming a thinker, an over-thinker, and eventually someone prone to analysis paralysis. They are so focused on what’s out of their control, they do not feel or notice what is in their control. Not surprisingly, this is called External vs. Internal focus. Thinkers use internal focus when moderating their self-talk and other mental skills. What they ignore is the physical part of the game: the feel of the ball off their hand and the inconsistencies that need some work. External focus is what I described above – paying attention to ball and pin reaction, seeing where others are playing and scoring, even noticing the breeze and temperature fluctuation. These are all external factors that thinkers might take into consideration before thinking about their swing plane or footwork. 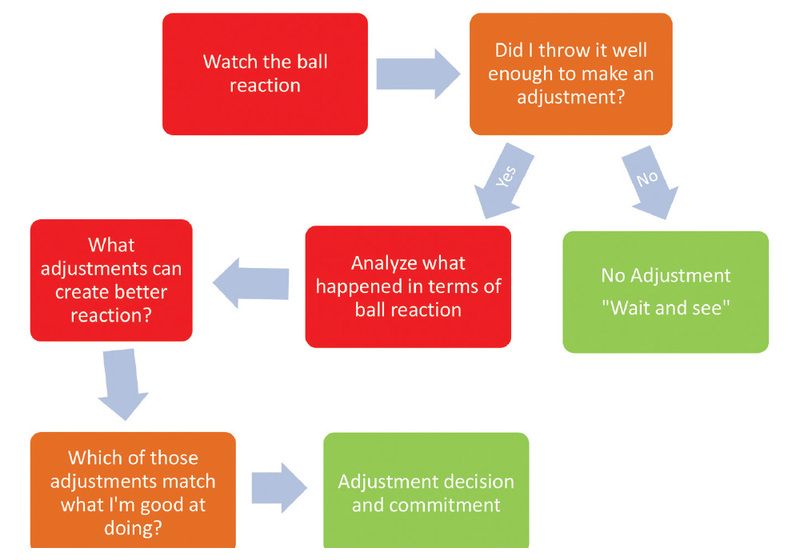 Two years ago I introduced a decision flow chart which detailed a way to approach decision-making on the lanes and I want to re-introduce it, except this time with an eye to the external vs. internal process. (See the Flow Chart Diagram below.) The red boxes indicate an external focus and the orange boxes indicate an internal one. Most thinkers tend to have their thoughts dominated by the external portions of the decision-making process. That’s not the whole equation for successful adjustments or physical execution. Like most sports, bowling requires being able to comfortably switch between the internal and external modes of thought. More importantly, it requires switching, or at least managing, the left and right brain. As many people probably already know, the left brain is the analytical, thinking side, while the right brain is the creative, feeling side (See the Brain Characteristics table below for some of the more commonly associated factors of each hemisphere). You’ll notice that the entire process in the first diagram is an analytical, methodical, and altogether factual way of thinking. Just what the left brain likes. Performing at your best, however, requires the right brain. So how do you switch? What comes between the decision-making process and the actual physical performance? The Pre-Shot Routine. Look at the Decision Making: Left to Right Brain diagram below and notice what happens to the same process with slightly different headings. The red is still external, orange is still internal, but both are analytical left brain processes. The goal is to get to the right brain in time to throw the ball, via the pre-shot routine. So here is where I believe the crux of the problems lie for most Thinkers. What inhibits their ability to perform is either an inability to access their internal focus on a physical level (used to make better decisions) or an inability to move into a right brain mode of thought. Let’s not forget the other scenario of simply needing work on their physical game and try to address all three. Over the years, the ideal physical game and release have changed drastically and will undoubtedly continue to evolve. Writers for this very magazine can disagree on some of the key aspects and it can be a matter of hot debate between the “new” school and the “old”. Even within schools there are disagreements. What it all boils down to is consistency and efficiency. If your movements are not efficient, they are likely not consistent. Lots of greats in this game have proven that theory wrong, though it is a generally true statement. If your movements are neither consistent nor efficient, you are likely to develop some serious injuries or a serious hate for bowling since your ball will certainly not be traveling down the lane either efficiently or consistently. Simply put, everyone can work on their physical game, but it takes an experienced coach to spot problems. Video is nice and one-on-one is better. Why is it better? Most videos I’ve seen people take of themselves include only one shot. One shot is not enough to determine what is inconsistent between shots. Rather we see what isn’t “textbook” or what looks to be inefficient. As I said earlier, there are many greats in the game with physical game “flaws”, according to the textbook, who still manage to be consistent. The coach’s job is to determine which areas are the ones for concern. Eliminate the inconsistencies and scores go up. The good news for Thinkers is that they are already accessing their internal focus when they use their mental game skills. Most thinkers will certainly have read books on the mental game or articles in this magazine and on the internet, so they should have some mental skills in their back pocket. These skills are almost entirely internal, so the problem is not an inability to focus internally, but a preference for focusing externally. To improve this, spend time at each practice both visualizing and then feeling an element of your approach. Visualize the feel of the ball off your fingertips and then pay close attention to that element at the release. Much like some form of strange on lane active meditation, make sure your mind accesses all the parts of your body, a few shots at a time. If it helps, start from the ground up. Start with the feet. Spend five shots being aware of their movement, placement, rhythm, and cadence. Then spend five shots focusing on your legs or knees. Work your way up to the head. The goal here is not to try to feel what is wrong, but simply to feel it at all. There’s no need to “manage” these things, but simply be aware of them on a greater level than normal. Some areas will be easier than others. Get to know your swing and your approach, your rhythm and your release. Being able to focus internally is of great benefit and will help the decision-making process as well as physical execution. Somehow, the pre-shot routine is still one of the most under-rated mental tools of the game. Even pros will look at great performances they’ve had and talk about how they were especially consistent in their use of imagery and positive self-talk as part of their pre-shot routine, then go out the next time and not use it as well. In another article on the pre-shot routine, I’ve referred to it as the time when you prepare your body and mind to perform. It’s really just a nice way of saying that it’s how you tell your left brain to shut up and let your right brain get the party started. What is a pre-shot routine? The good ones all include some form of visualization – your mind conjuring up images, sights, sounds, smells, and feelings that you’d like to achieve, have achieved, or are preparing to achieve. More importantly, this is all taking place in the creative side of your brain. By having this be the last thing you do before the performance of a shot, you are placing yourself into the ever-capable hands of your right brain. When you try to control an element of your swing or start to think about the next ball change while shooting a 10 pin, you are reverting to the left brain and hurting your odds of throwing the best shot you can. The left brain likes control and often tells the hippy right brain to grow up and do something useful. In sports, however, the right brain is the useful one and the one that will help you achieve success. In the bowling center where I’ve bowled and coached my entire life, the settee area is a tiled area. To bowl, the bowler must step down onto the approach in order to pick up the ball and take their starting position. It is a fantastic physical barrier to remind you that the thinking happens on the tile and the feeling happens on the wood (or synthetic as it usually is nowadays). Almost all bowling centers have some kind of demarcation like this so every bowler has an easy reminder of when to think and when to feel. For Thinkers to truly achieve success in the game of bowling, they don’t just need to know what to think. They need to change how they think so their physical performance can be unhindered and free.